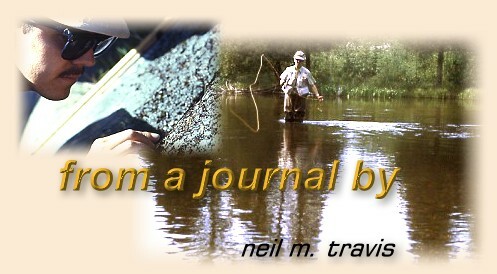 In last weeks column I wrote about taking a minimalist approach to fly fishing gear and from some of the comments that were posted on the bulletin board it must have hit a responsive chord among some of my readers. It should be understood that I did not intend to insinuate that anglers who take a semi full of gear with them each time they go fishing are doing it wrong. What I was suggesting was we all might find that we have more fun with a little less stuff. I have been chasing fish with flies for almost a half century, and having taught both fly casting and fly tying at various times during those years so I have accumulated more than my share of excess gear. However, what I have observed is that much of that stuff never gets used. I have rods that have not seen the light of day for years, flies that have never been on the water, and a variety of gadgets and widgets that I have never used. If I started tying a dozen flies each day it is unlikely that in my remaining years of life that I could use up all of the fly tying stuff that I have gathered over the years. If that sounds like you perhaps you can learn from my mistakes. Being a minimalist does not mean that you cannot experiment with new patterns, or that you can't own a closet full of gear. It does not mean that you don't own two nippers, more than one pair of waders, an extra hemostat or more than one pair of Polarized glasses. It simply means that when you go fishing you don't carry every one of them with you on the stream. Unless you enjoy being a beast of burden each time you go angling I would suggest you might consider a more modified approach to the sport. One of the responses posted on the bulletin board said they only carried a few soft hackle caddis patterns because they are the type of flies which are dominate on the waters they regularly fish. They supplement those few patterns when they travel to other places, but on their home water these few patterns are sufficient. This is an excellent approach for the angler who only regularly fishes in one area. The angler who has identified the patterns that work on a regular basis can spend more time doing what they came to do, namely fishing, and less time trying to figure out what fly to use. For those anglers who travel around to various places another system must be adopted. What works on stream A will not suffice for stream B which has entirely different hatches. This is the situation that I enjoy in Montana, and I find it necessary to have a variety of flies and even different types of equipment to cover the various angling situations that I encounter. This calls for organization to insure that I don't arrive on DePuy's Spring Creek with flies that are only suitable for fishing on the Yellowstone River. The place to get organized is at home and not when you are standing along the stream in your waders. First, all your flies should be sorted by type and size. Dry caddis patterns should be in one box, midge pupa in another, etc. I don't put size 12 dry flies in the same box with size 18 midges for the simple reason that I have yet to encounter a situation where I needed both at the same time. If you fish in a place where you have the need for both sizes during the same day then I would suggest that you have them in separate boxes. What patterns and sizes that you carry on any given trip will be influenced by what type of trip you are taking. If you are fishing from your vehicle, unless you have to walk a considerable distance before you start fishing, you can carry less gear. If you find that there is a certain size or pattern that is necessary a quick trip back to the vehicle is all that is required to remedy the problem. If you are fishing from a boat or using a float tube or pontoon and returning to the vehicle would not be practical or expedient you might want to carry extra flies. When floating this is not a problem since it is not necessary that you pack them in your vest. At the risk of offending, as if that normally would be a problem for a retired judge, I would suggest that some degree of minimalism will force you to become a better angler. If you are going to be a successful minimalist you must know what flies are going to be needed, and to obtain that knowledge you must apply yourself to learning everything that you can about the places where you fish. When you carry a limited number of patterns you are more likely to be more observant, take more time to study each situation, and choose your imitation more carefully. You will spend less time changing flies or search through your fly box and more time actually fishing, and that has to be a good thing. Neil emailed me that he would be working on banding hummingbirds Monday morning at Madera Canyon, Arizona. 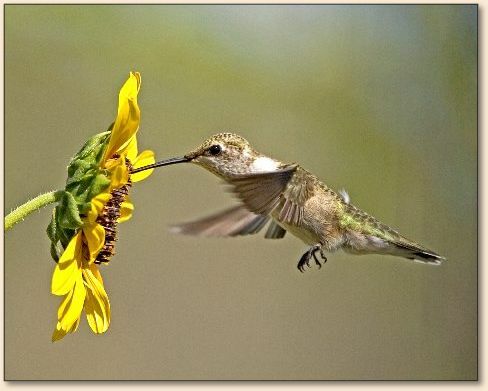 Below is a photo he sent of a banded immature Black-chinned Hummingbird. Can you see the band?